How long after a storm does it take for Chesil Beach to become safe enough to fish? Will I be able to fish Chesil this afternoon? Well the answer to those questions depend on a number of factors. First is the length and strength of the storm, and we assume that it was South Westerly. Another factor is the direction and strength of the wind once the storm has passed. It goes without saying that the longer and stronger the gale was, the longer it will take to calm down. However if the wind direction changes, especially if it goes Easterly and becomes quite strong, it will flatten the sea down quite quickly. The picture above shows conditions at 7.45 this morning. The wind has now shifted to the North West and is blowing at around 20mph. It will drop a bit during the day, which will mean that Chesil should become fishable later this afternoon. However, it will still be very dangerous. Conditions will be difficult and there may be a lot of weed around. Landing a fish is always hard when there is a lot of undertow. Do not take any chances, keep well back from the waters edge no matter how big the fish is. I am out guiding today again, and I hope to fish Chesil, so I will keep everyone up to date on Facebook (link top right), as to the conditions on Chesil. Check the webcam to see if the surf looks like it is dropping, and if you do come down to Chesil, make a decision for yourself, whether you think it is safe for you to fish. There is always tomorrow! The rewards for being on the right part of the beach at the right time can be fantastic, as this picture of Mark shows. 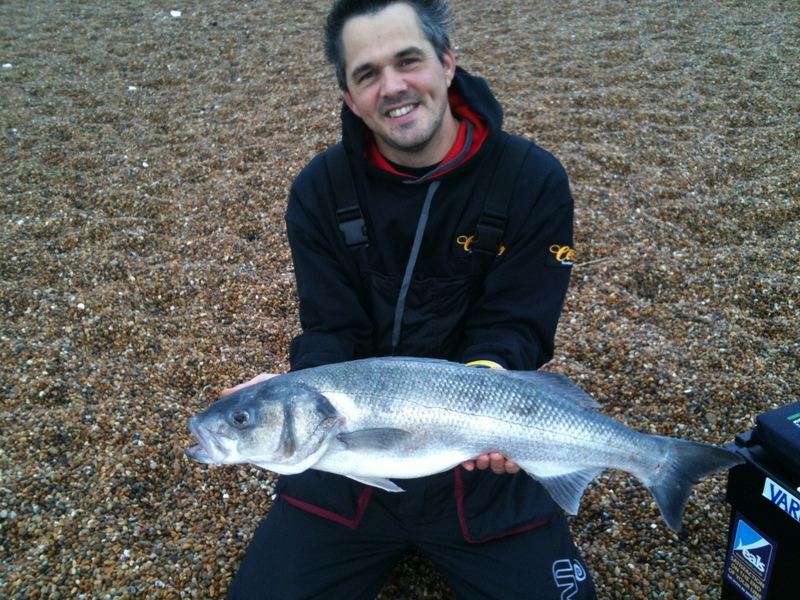 He landed this 10lb 2oz Bass from Abbotsbury on two Black Lug aimed at Cod. That is exactly the kind of fish I am looking for today. If Chesil stays too rough, or you don’t fancy fishing it, then have a look at your other options below. Chesil Beach: Unfishable at 8am this morning. It should drop rough conditions this afternoon. There is a lot of weed in the Cove and at Ferrybridge. Portland: 4m swell with coloured and weedy water on the West. The East side away from the Bill is calmer with 2m waves. 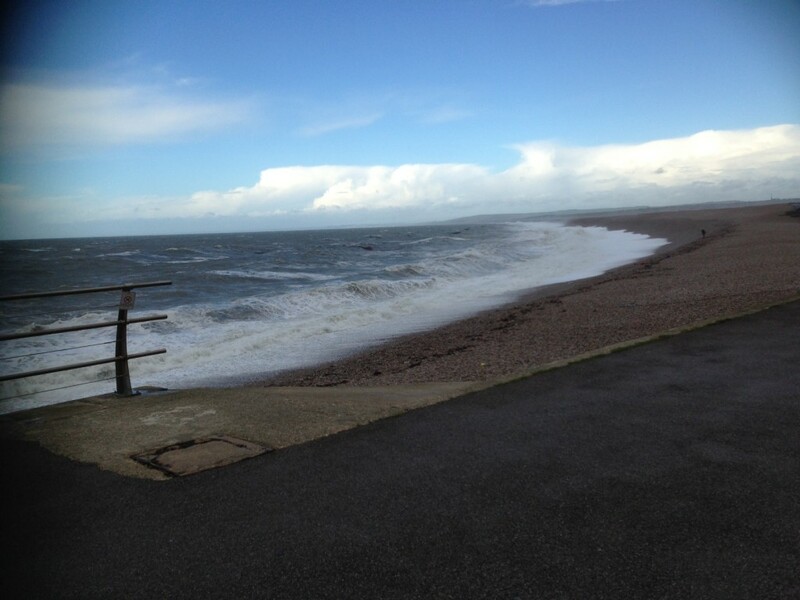 Chesil Beach forecast: Once the waves drop to 1.5m, the beach will be fishable. It will be rough, so use big baits on short snoods (12 inches). I prefer to use either a Pulley rig with a 5/0 baited with Peeler, or a Pulley Pennel baited with Squid and Lugworm. It is better to put a big bait out 40yds in the these conditions than a small bait at 100yds. Portland: Only one mark I would consider on Portland today and that is Church Ope Cove. You have the chance of Bass, Pollock, Conger and Bull Huss. Once again, big baits, especially Mackerel on this mark. Portland Harbour: We fished Portland harbour yesterday with little success. I believe that was due in main to there being lots of food scources elsewhere. It is still worth a go around Ferrybridge for a Bass or Pollock. 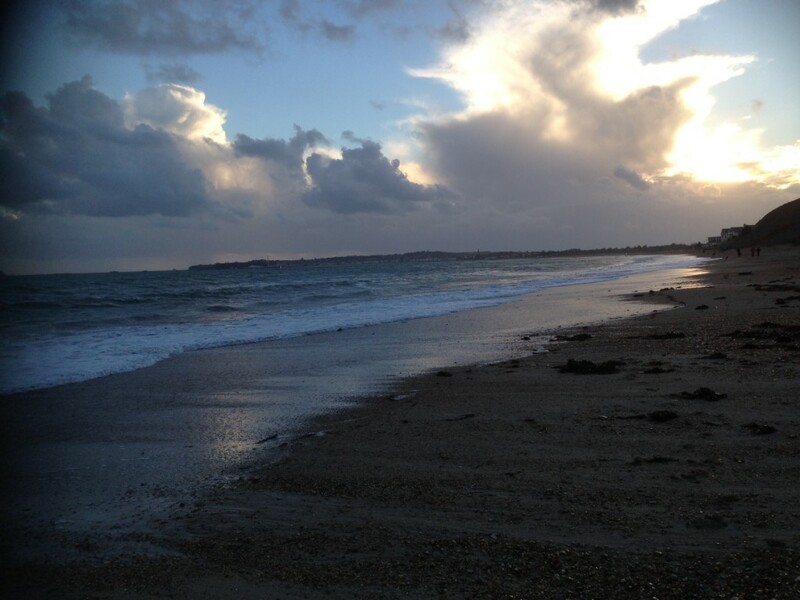 Weymouth Bay: After trying a number of marks yesterday, we ended up at Bowleaze Cove. 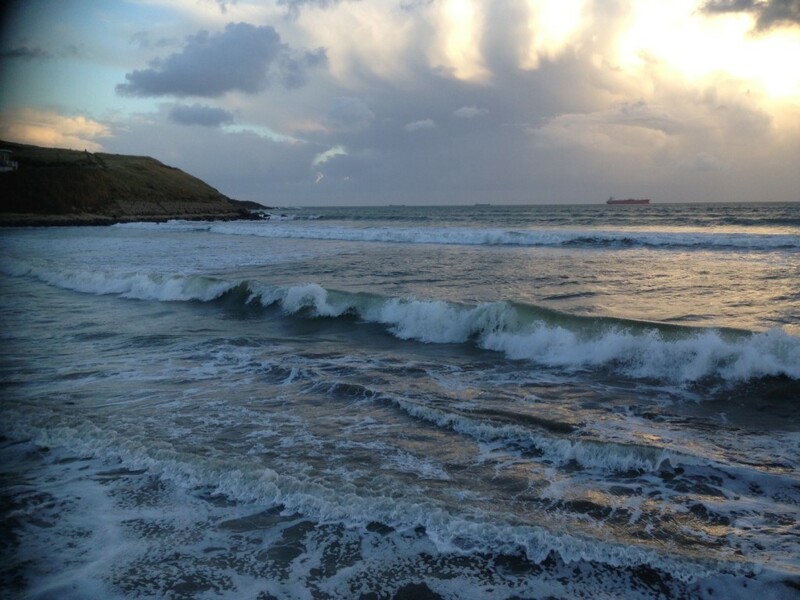 The Sealife centre end of Preston Beach looked clear of weed, but we could see some nice breakers at Bowleaze. The main concern there was the amount of weed that gets driven into the corner. We moved along a bit, but our first two casts were snapped of by weed. However we persevered as it looked very Bassy. A quick move along a bit to a slightly less weedy area and a change of tactics. Single light rod held in our hands. It worked as we managed to find the Bass.